Nightcrawler is one of those films that feels like a miniature miracle: both brooding and action packed, it’s the kind of film that will unite both art house and mainstream audiences. Nightcrawler serves mainly as a vehicle for Jake Gyllenhaal as well as a vehicle for a culture that is filled by vehicles. Here is a film that manages to be about so many things and is also one of the best thrillers I have seen in a long time. The spirit of Film Noir is strong with this one. A lot has been said about Jake Gyllenhaal’s performance in this film, and that’s because he all but gets on his hands and knees and begs for an Oscar and basically earns it. It is an oddball performance for the ages. Gyllenhaal plays Louis Bloom, a mysterious man (or is man child a better way to describe him?) looking to break into the world of crime journalism. He runs into the middle of crime scenes without authorization and gets the kind of shots that nobody else can. Depending on how you look at it, his ambition is either inspiring or terrifying. Or maybe a little bit of both. Now, Louis is really good at his job. He has never had a real job before, but he has read a lot about how to be professional on the Internet. Louis has lived most of his life on the Internet, and he seems more like a machine programmed with past life experiences than a person who has actually had any sort of life at all. We never know why Louis wants to be part of this world at all, but it is most likely out of the thrill of watching crimes unfold without actually having to commit them. Gyllenhaal’s performance and character has been compared to Travis Bickle. I see him more as a mix between Patrick Bateman and Ryan Gosling in Drive. Louis is kind of a contradictory sociopath: he both manipulates people and doesn’t understand them at all. Louis Bloom definitely belongs in the Sociopath Hall of Fame. Gyllenhaal plays him like a bug eyed Jared Leto. He’s too weird to live, yet too rare to die. 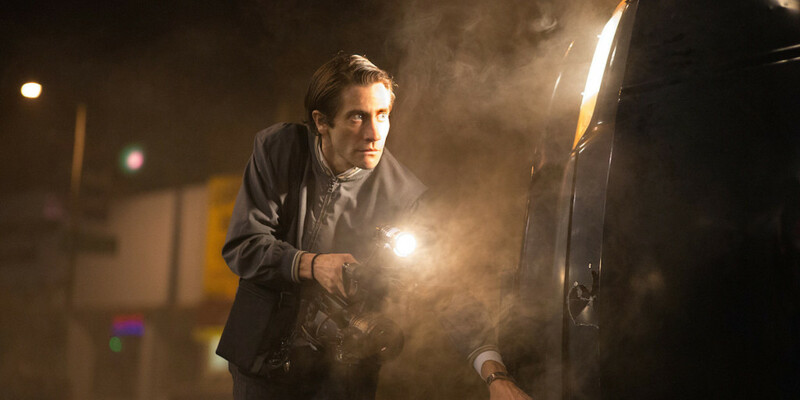 Nightcrawler serves as both character study and crime thriller. When Louis brings his footage to a local news station, it becomes a critique of how the media handles crime stories. First time director Dan Gilroy, who already feels like an old pro, wears so many hats here. When Louis is filming criminals on the streets, it feels like a Michael Mann film. When Louis is chasing news director Nina (Rene Russo) through the news studio, it feels a bit like a more serious version of Anchorman. Gilroy also makes Los Angeles look really good. And he doesn’t try to make it seem like something it is not: it is a series of sprawling, disconnected suburbs that is in love with cars. The film takes place almost entirely at night, which is when the city looks prettiest and grittiest. There is a stereotype that all people in LA talk about is driving directions. Well, that is all anybody talks about in Nightcrawler. However, the small talk becomes interesting when taking Santa Monica Boulevard over The 101 can mean the difference between life and death. Nightcrawler is one of those films that seems to end on a happy note. But if you are a good movie watcher, then you will know that there is something lurking underneath. Exceptional films don’t like to wrap up in a little bow; they should challenge the audience with a little bit more than they were expecting. This is a low key action picture, and the best found footage film I’ve ever seen (we can debate whether or not to call it that). This is just one of those films that felt like an instant classic the from the moment it started to the moment it ended. This entry was posted in Uncategorized and tagged Crime, Dan Gilroy, Film Noir, Jake Gyllenhaal, Los Angeles, Movie Review, Nightcrawler, Rene Russo, Thriller on November 2, 2014 by ian0592.